These designs are to fit Santa’s little Elf Helper, as she sits on her shelf. Instructions are given for a Ballerina Outfit, a Swimsuit and Bag, a Skirt, a One-piece Sleeping Suit, and a Toy Doll. 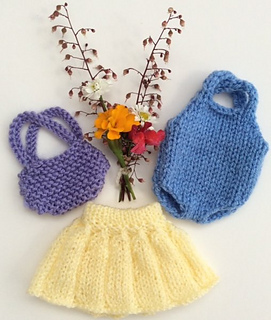 The designs are knitted using small balls of DK yarn and are ideal for using up coloured oddments. Buttons and press studs (snaps) are needed for some of the designs, and a small piece of net fabric for a tutu. 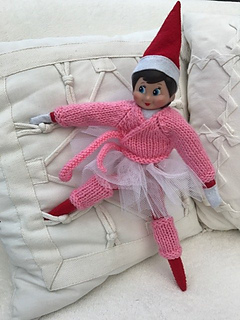 Enjoy customising your elf and giving her different scenarios to work with! 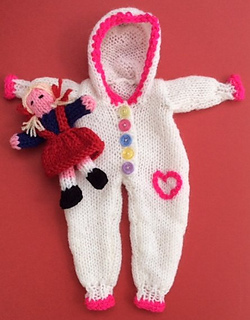 Other patterns also available from my store include a Sweater collection, a Football outfit, an Argyll sweater, shorts and trousers, and a Toy Teddy.